The adult bladder is located in the anterior pelvis and is enveloped by extraperitoneal fat and connective tissue. It is separated from the pubic symphysis by an anterior prevesical space known as the retropubic space (of Retzius). The dome of the bladder is covered by peritoneum, and the bladder neck is fixed to neighboring structures by reflections of the pelvic fascia and by the true ligaments of the pelvis. Conversely, the bladder of a child is an abdominal organ and contacts the lower two thirds of the abdominal wall between the symphysis pubis and the umbilicus. 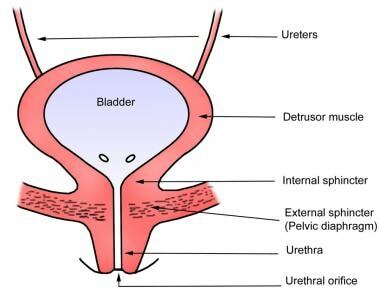 The bladder rapidly descends during the first few years of life and then slowly descends until approximately the 9th year of life when it approaches the adult position. For more information about the relevant anatomy, see Bladder Anatomy. See also Female Urinary Organ Anatomy and Male Urinary Organ Anatomy. Local anesthesia, in the form of a skin wheal, is placed using lidocaine at the insertion site to reduce discomfort. The insertion site can be identified beforehand with bedside ultrasonography, if available (see Technique for more details). For more information, see Local Anesthetics Agents, Infiltrative Administration. The patient should be supine with the abdomen and pubic areas exposed. Consider placing the patient in slight Trendelenburg position. If ultrasonography is unavailable and the bladder is not palpable, the authors advise delaying the procedure. Sterilize the area with povidone-iodine (Betadine). Palpate the symphysis pubis and inject local anesthetic 2 cm above the superior edge of the symphysis or at the sonogram-determined insertion site. See the image below. Place a small skin wheal of lidocaine at the planned insertion site. For aspiration, select a 22-ga needle for pediatric patients and a 20-ga needle for adults. Choose a needle of appropriate length (eg, shorter for children, longer for adults) and attach it to a 10- or 20-mL syringe. Pediatric: Insert the needle slightly cephalad, 10-20° off perpendicular, and advance. In a young child, the bladder is still an abdominal organ. Adult: Insert the needle slightly caudad, 10-20° off perpendicular. In an adult, the bladder is a pelvic organ. If the procedure is performed using ultrasonographic guidance, the bladder appears to tent as the needle pierces its anterior wall. (Of note, the ultrasound transducer should be placed in a sterile probe cover that contains ultrasound gel to maintain a sterile field during the procedure.) See the images below. Insert the needle while aspirating. Urine appears within the syringe. Once urine is obtained, remove the needle and apply gentle pressure at the insertion site with sterile gauze. Place a sterile dressing at the site of insertion. Place the urine specimen in a sterile container approved for urinalysis and culture. Once placement is confirmed (urine aspirated), remove the syringe and insert the guidewire from the cystostomy tray through the needle. Remove the needle using the Seldinger technique and use a scalpel to make a small incision at the insertion site, adjacent to the guidewire. Thread the peel-away sheath introducer over the guidewire into the bladder and remove the wire. Insert the Foley catheter through the peel-away sheath introducer. Deploy the Foley catheter balloon with 10 mL of 0.9% saline. Remove the peel-away sheath introducer from the Foley catheter and pull back on the catheter until resistance is met. Secure the catheter tubing to the abdominal wall with sterile dressing. ​Once placement is confirmed (urine aspirated), remove the syringe. Use an 11-blade to make a stab incision at the insertion site. Remove the protective sleeve from around the catheter and balloon and place the sharp obturator in the catheter locking it into place with a Luer-lock syringe. Advance the balloon catheter 10o caudad from the true vertical aiming toward the pubic symphysis, with one hand at skin level to guide the catheter and one hand on the back of the trocar to stabilize and apply firm steady pressure. Advance the catheter until urine is seen (if bladder pressure is low, this step may require aspiration before urine return is noted) and then advance no more than an additional 4-5cm to ensure that the balloon is completely in the bladder. Use 10cc sterile water to inflate the catheter balloon, attach the catheter to a drainage bag. Alternatively, the catheter may have a stent at the end. In this case advance the suprapubic tube as above into the bladder, apply tension to the accompanying string to engage the curl of the stent, and secure the string to the catheter to affix the stent in place. Secure the indwelling catheter in place using a 2-0 or 3-0 Nylon suture with the suture being tied first with an air knot to the adjacent abdominal wall and then wrapped around the catheter to secure in place. Place dressing over the site. The needle insertion site is approximately 2 cm above the symphysis pubis. From the true vertical, the needle should be angled 10 º cephalad in children and 10 º caudad in adults. If available, use bedside ultrasonography to visualize the bladder and observe the needle puncture the bladder wall. Stine RJ, Avila JA, Lemons MF, et al. Diagnostic and therapeutic urologic procedures. Emerg Med Clin North Am. 1988 Aug. 6(3):547-78. [Medline]. Beeson PB, Guze LB. Observations on the reliability and safety of bladder catheterization for bacteriologic study of the urine. N Engl J Med. 1956 Sep 6. 255(10):474-5. [Medline]. Hardy JD, Furnell PM, Brumfitt W. Comparison of sterile bag, clean catch and suprapubic aspiration in the diagnosis of urinary infection in early childhood. Br J Urol. 1976 Aug. 48(4):279-83. [Medline]. Sastre JB, Aparicio AR, Cotallo GD, Colomer BF, Hernández MC. Urinary tract infection in the newborn: clinical and radio imaging studies. Pediatr Nephrol. 2007 Oct. 22(10):1735-41. [Medline]. Wingerter S, Bachur R. Risk factors for contamination of catheterized urine specimens in febrile children. Pediatr Emerg Care. 2011 Jan. 27(1):1-4. [Medline]. Simforoosh N, Tabibi A, Khalili SA, Soltani MH, Afjehi A, Aalami F, et al. Neonatal circumcision reduces the incidence of asymptomatic urinary tract infection: A large prospective study with long-term follow up using Plastibell. J Pediatr Urol. 2010 Nov 4. [Medline]. Robinson J. Insertion, care and management of suprapubic catheters. Nurs Stand. 2008 Oct 29-Nov 4. 23(8):49-56; quiz 58. [Medline]. Gochman RF, Karasic RB, Heller MB. Use of portable ultrasound to assist urine collection by suprapubic aspiration. Ann Emerg Med. 1991 Jun. 20(6):631-5. [Medline]. Noller KL, Pratt JH, Symmonds RE. Bowel perforation with suprapubic cystostomy Report of two cases. Obstet Gynecol. 1976 Jul. 48(1 Suppl):67S-69S. [Medline]. O'Brien WM. Percutaneous placement of a suprapubic tube with peel away sheath introducer. J Urol. 1991 May. 145(5):1015-6. [Medline]. Promes SB. Miscellaneous Applications. Simon BC, Snoey ER. Ultrasound in Emergency and Ambulatory Medicine. St. Louis, MO: Mosby, Inc; 1997. 256-261. Schneider RE. Urologic Procedures. Robert JR, Hedges JR. Clinical Procedures in Emergency Medicine. 4th ed. Philadelphia, PA: W.B. Saunders Co; 2004. 6(3): 1098-1100. Moustaki M, Stefos E, Malliou C, Fretzayas A. Complications of suprapubic aspiration in transiently neutropenic children. Pediatr Emerg Care. 2007 Nov. 23(11):823-5. [Medline]. Vilke GM. Bladder Aspiration. Rosen P. Atlas of Emergency Procedures. St. Louis, MO: Mosby, Inc; 2001. 130-131. Shidan Tosif, Alice Baker, Ed Oakley, Susan Donath and Franz E Babl. Contamination rates of different urine collection methods for the diagnosis of urinary tract infections in young children: An observational cohort study. Journal of Paediatrics and Child Health. 2012. 48:659–664. [Medline]. Badiee Z, Sadeghnia A, Zarean N. Suprapubic Bladder Aspiration or Urethral Catheterization: Which is More Painful in Uncircumcised Male Newborns?. Int J Prev Med. 2014 Sep. 5(9):1125-30. [Medline]. [Full Text].